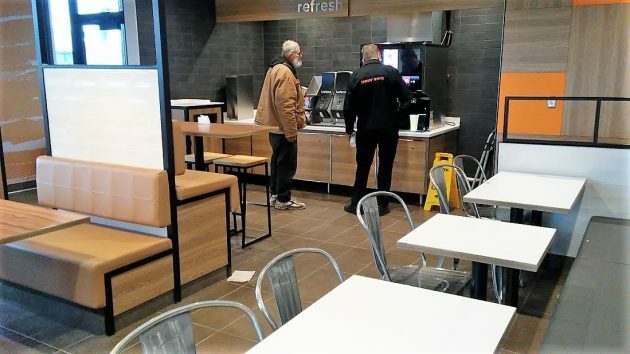 Like its Albany counterpart on the other side of town, near Interstate 5, the West Albany McDonald’s has been completely remodeled, and it doesn’t look like anything you were used to before. I stopped on a bike ride through town and took a look on the afternoon of the last day of the year. 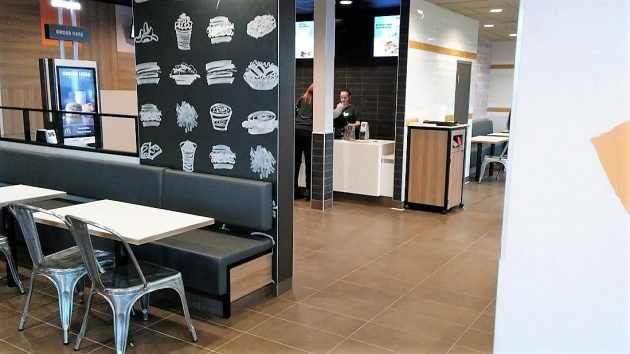 I had not considered there was anything wrong with the previous layout and décor, but the McDonald’s company obviously thought otherwise. Apparently in response to a sales slump in recent years, the 60-year-old company based in Illinois has been ordering face-lifts at all of its thousands of franchise restaurants across the U.S. Stories on websites such as delish.com quote the company brass as saying they wanted to get away from the “cafeteria” atmosphere in their franchise restaurants. That surprised me, because to me the new look resembles nothing as much as a corporate or even school cafeteria — all sleek and smooth and muted colors. The idea supposedly was to make the interior feel more intimate. To me, it feels the opposite, more like an institutional place for hurried meals. There are, of course, touch-screen ordering kiosks in the new layout, two of them. (Each has two sides, so there are four screens from which to order.) But there’s also a counter for ordering from a person. What else is different? No more outdoor playground, which might be a disappointment for parents with small children. Now they’ll have to go to an actual park to find a play structure their kids can climb. An ordering kiosk on the left. Or you can order from an employee, as before. No more playground fence to lean a bike against. The seating arrangement is one of the things that has been changed. Mickey D’s Is almost ready. We highlanders have missed your good ole “Scottish” food! Hail Mickey D’s!! Corporations lie. The reason they remodeled is to make as many people as possible order from a kiosk and get rid of some people as employees. They just don’t want to say that. Their food is better than most fast food, except for Burgerville and some of the Taco places I was at the new place on the 30th; had an egg mcmuffin…took the gal forever to get my order. The egg was too runny for my taste. They will get the “bugs,” so to speak, worked out, I’m sure. I won’t try another egg mcmuffin unless I am in Corvallis. Ok so it wasn’t me. I felt the same about the egg McMuffin. I told my husband nit wasn’t cooked all the way. 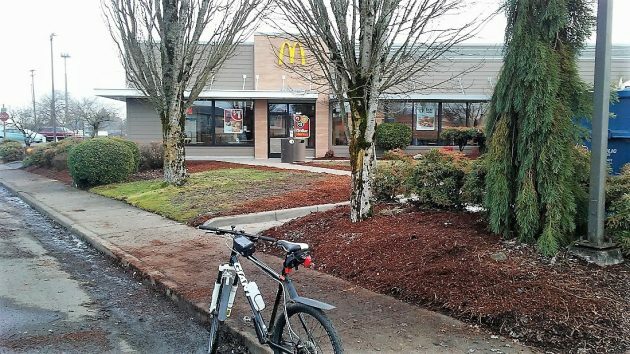 Slight correction the McDonald’s near interstate 5 was completely destroyed and rebuilt, this one was merely remodeled. People who want to raise the minimum wage to $14- $15 an hour, this is what you’ll get!! Companies will now start replacing employees with apps and computers. Applebee’s has already started doing this with tablets at booths so customers can order with out needing a waitress. Imagine if they made all gas stations self serve..How many people would be out of a job then? More automation is happening regardless of what the minimum wage is. Raise it; lower it doesn’t make any difference when it comes to automation, when virtually every person is connected 24-7 with that device already in your hand. You need to catch up with reality Zack, instead of believing that change is solely political. A discussion revolving around the remodel of a hamburger joint definitely falls into the realm of First World Problems. Does it have the ordering Kiosks. I do not like them. I would rather just order at a counter and get what I want. We tried once my husband ordered his and I wanted to add my order and could not get it to work, embarrassed, I work with computers all day. I find them slow and cumbersome. The “sitdown chains” have the table electronics for over 5 years. The play area really didn’t promote sales. Looks to me that footprint ended up in the kitchen. I stopped at the one by I5 where my wife had worked for many years. I made the mistake of ordering from the kiosk. I always got my double quarter w/cheese with shredded lettuce and mayonnaise. But the kiosk limits your choices. I could get no pickles with no problem but nothing for the mayo or lettuce. I should have gone to the counter but I wanted to try the kiosk just for novelty. The staff was friendly and table service is something I had only seen in McD’s overseas. News flash: not sure why any of this matters because Hasty Freez is still open for business. Such a “healthful” discussion over junk food as waist lines bulge! Damn little on any of those corporate menus from any chain that is close to being a proper diet. Save maybe for the limp lettuce. Chow down now at the corporate trough as the medical payoff is in the future at the for profit health services. Who can blame Mickey D? Kiosks eliminate pesky labor costs. There’s less liklihood of irritating employment discrimination laws. About ten years ago I got tired of being a second-class citizen. After once being refused service and once being totally ignored, I quit going to those places, with no regret, especially after increasing my health consciousness. Was I shirtless or shoeless? No, those days are long gone. 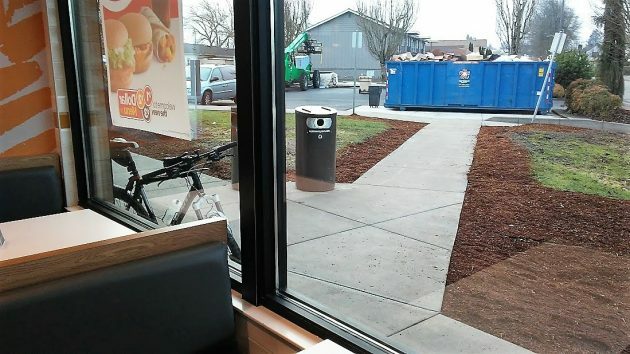 My effrontery was wanting to use the drive-thru on my bike. Maybe there’s a law, maybe just Burger King policy, maybe neither. I just didn’t want to face another indignity, and by now I don’t even think of going there (any of them).